At front left, Marion with husband, Daniel. Left, 4th from front, Johann. Front right, Angela. After inconsistently coming to the Planetarium Negara Group run, I finally met Daniel and Marion, who have been in Malaysia for about 6 months. Daniel, originally from Mexico, related that he has run with a runner from the famed Mexican ultra long distance tribe, the Tarahumara. He ran or jogged with the Tarahumara guide who seemed like he was having a brisk walk. During the 8 hours, Daniel carried litres of water, while the guide's only hydration was a can of Coke! Daniel and Marion are pretty fast, running sub 50 minutes for 10km. With this pace, Marion is happy that she gets onto the podium in some local races. I also met Johann and Angela for the first time today. Angela is quite new to running and was helpfully guided by her friend, Li Leen. A warm welcome to all the newbies! 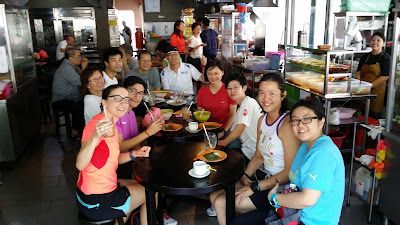 After our run, we adjourned to our favourite coffeshop, Restoran Shangri La, on Jalan Batai.